Abstract. 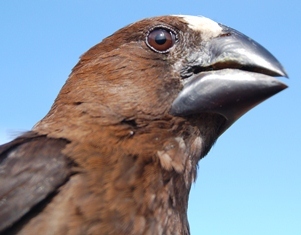 Molecular analyses support a sister group relationship between the African Cuckoo Finch (Anomalospiza imberbis) and Viduidae (whydahs and indigobirds). This result was interpreted as evidence for a single origin of brood parasitism in Old World passerines. 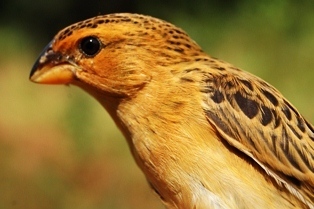 However, it went unnoticed that A. imberbis shares an unusual derived morphology of the pterygoid/palatine complex with the African Grosbeak Weaver (Amblyospiza albifrons), whose affinities could not be resolved in molecular analyses. The unusual and extensive fusion of the pterygoids and palatines of the two species is likely to constitute a synapomorphy of Anomalospiza and Amblyospiza. Sister group relationship between these taxa would indicate that brood parasitism has either been lost secondarily in Amblyospiza or, more likely, evolved independently in Anomalospiza and Viduidae. There is a large difference in size between these two species (wing of the Thick-billed Weaver is 79-104, and wing of the Cuckoo Finch is 63-74), but both have proportionately thick bills.